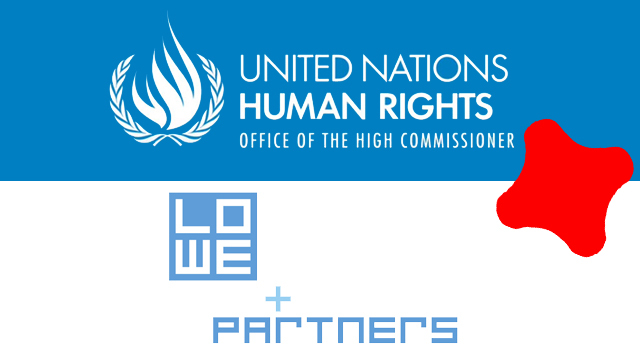 LONDON / GENEVA / NEW YORK – November 15, 2011 – Lowe and Partners has been appointed to create a global digital and social media campaign for the United Nations to promote Human Rights Day 2011, which takes place around the world on December 10. 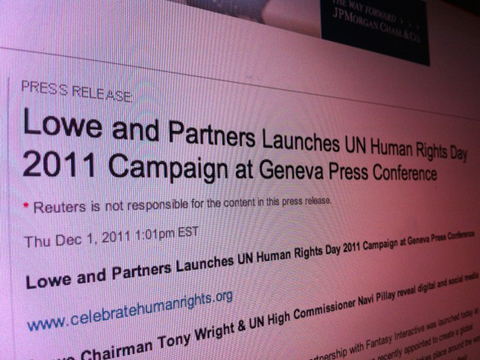 This will be the first time the UN Human Rights Office has used social media in their celebration of Human Rights Day. The campaign idea originates from Lowe Bangkok, supported by Lowe Deutsch NY and Lowe and Partners London. The network is partnering with Fantasy Interactive, the global digital agency appointed to co-create the digital and social media campaign – which is designed to inform, connect, engage, celebrate and share – and be accessible to all ages and nationalities. “Celebrate Human Rights Day” will be revealed at a UN Press Conference on December 2nd in Geneva, by Lowe Chairman, Tony Wright and Navi Pillay, UN High Commissioner for Human Rights. Navi Pillay, UN High Commissioner for Human Rights, said: “Thanks to hundreds of thousands of brave people, armed only with words and ideals, 2011 became the year of human rights, in a way we could never have imagined 12 months ago. They took to the streets and squares, and to the social media highways, and demanded change. They used the Internet and instant messaging to inform, inspire and mobilize supporters to seek the basic human rights to which we are all entitled. For this reason, launching a digital campaign with the help of Lowe and Partners and Fantasy Interactive for this year’s Human Rights Day is an appropriate way not only to celebrate the passing of an extraordinary year, but also to look forward to an exciting and hopefully brighter future, where everyone’s rights are understood and respected. Human Rights Day is observed every year on 10 December. It commemorates the day in 1948 that the United Nations General Assembly adopted the Universal Declaration of Human Rights. The Universal Declaration of Human Rights (UDHR) is a milestone document in human history. Its 30 articles set out, for the first time, fundamental human rights to be universally protected. It is a common standard of achievement for every person and every nation. The UDHR is the most universal document in the world, having been recognized by the Guinness Book of Records as the most translated document ever: currently at 382 different languages, from Abkhaz to Zulu. The Declaration contains a broad range of political, civil, social, cultural and economic rights. Lowe and Partners is a modern agency network with a difference. Our clients call it reach without compromise. We’re a network of distinctive diverse agencies with intimacy and scale, rich in local culture, founded and grounded in our ability to shape and share engaging ideas. We’re at our best building big creative ideas that put the brand into the heart of popular culture. We like engaging the many not the few and we love to work in difficult categories. We work to deliver Populist Creativity through the laser like analysis of the core problem and brilliant insight into contemporary culture. Our work changes behavior online and off, inspiring people to act. Fantasy Interactive (Fi) is a global digital agency that uses imagination and strategic insight to narrate digital stories for some of the most innovative brands in the world. Fi specializes in leveraging digital channels (interactive design, UX, mobile & app development, social media and rich media) for multinational brands such as Google, HTC, CBS News, Red Bull, Ducati and Porsche. Founded in 1999 on the premise that creativity and imagination reign supreme, Fi strives to conceive, collaborate and produce game-changing ideas to help brands connect with users online. The result is an experience that engages communities, builds brand loyalty and creates a one-of-a-kind user experience. As one of the first agencies inducted into the FWA Hall of Fame, Fi has also been named Agency of the Year by .net Magazine and listed as one of the “World’s Top 21 Most Inspiring Companies” by Imagine Publishing in 2007 along with groundbreaking brands like Apple and Pixar. Fantasy Interactive (Fi) has offices in New York, London, San Francisco, and Stockholm. For more information, visit us at www.f-i.com and join the conversation at www.facebook.com/Fi and www.twitter.com/F_i.